Madagascar: Antananarivo, Antsaribe, Ambatolampy, Vakinakaritra, Ambositra, Betsileo Country, Ranomafana National Park, Fianarantsoa, Ambalavao, Andringitra Massif, Tsaranoro Forest, Ranohira, Isalo National Park, Nymphes Waterfall, Tulear, Ifaty Village, Boatride to Amboaboaky, Reniala Boabab forest, Andasibe National Park, Vakona Reserve. Mauritius: Tamarin Bay Lagoon, Trou au Cerfs, Macchabee Forest, Grand Basin Lake, La Rhumerie de Charmarel, Pamplemousses Botanic Gardens. Home to five percent of the world’s plant and animal species including the elusive Indi Indi Lemur, Madagascar is a country like no other. 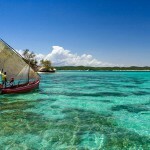 From the bustling streets and sacred hills of the Antananarivo to the exotic forests of the Ambohitantely, from the craggy promontories of the Ankarana National Park to the granite landscapes of the Tsaranoro Valley, Madagascar is a land of striking contrasts and exhilarating scenery, making it an absolute must for nature enthusiasts and adventurers alike. Depart Perth with Air Mauritius at 13.05 and arrive in Mauritius at 17.40 for transfer to our 4 star accommodation. Once there, sample Mauritian cuisine with a delicious, refreshing dinner Overnight stay, Hotel DBB. After a filling local breakfast and a briefing by tour leader Sandra, enjoy enough time before departing with Air Mauritius at 14.30 and arriving in Antananarivo at 15.10. On arrival, meet with our local guide at the airport and transfer to the Belvedere Hotel in the central heart of the city. Overnight stay, Belvédère Hotel DBB. In the morning, take a four hour drive to the thermal city of Antsirabe with ample photo stops along the way, including one at Ambatolampy, known for its forging and foundry industry craftsmen and their quality aluminium pots. Then, onto Antsirabe where, after hotel check-in, visit the city centre and view its diverse architectural heritage, as French cottage-style houses adjoin Scandinavian villas with English style gardens. Dinner and accommodation at the hotel. Overnight stay, Royal Palace Hotel DBB. After breakfast, go for a walk in the rural Vakinakaritra countryside, some 20km south of Antsirabe, and the potential to enjoy a unique swim under a natural cascade. Then, enjoy a walk through the rice fields, small villages and schools typical of this region. There, meet with friendly local farmers and gain a first-hand insight into their daily lived experience. Finally, after a picnic lunch, continue discovering the landscape and return to the hotel in the late afternoon. Overnight stay, Royal Palace DBB. Continue to the pretty town of Ambositra, famous for the Zafimaniry tribe’s wood carvings and handicrafts, from intricate baskets of raffia and straw to polished wood and stone goods, including marquetry. After lunch, cross the Betsileo country, characterised by large rice fields and eucalyptus forests, and arrive late afternoon in Ranomafana. Overnight stay, Centrest Hotel DBB. Take a morning guided visit within the World Heritage Ranomafana National Park, elevated some 1,170 metres above sea level and boasting a temperate, wet forest bio-zone. Here, the Atsinanana have more than 41,600 hectares of tropical rainforest, the park being home to rare species of flora and fauna, including 115 species of birds, among them the Hent’s hawk, land rollers, and the crested ibis, which co-exist with unique lemurs – golden, bamboo, red bellied and brown lemurs – in a delicate ecosystem also home to medicinal ferns, euphorbia and epiphytes. In the afternoon, take the road to Fianarantsoa, then to Sahambavy, by the town’s expansive lake, a primary reason for the fruitful harvests experienced by the region’s farms. Overnight stay, Lac Hotel DBB. Today, visit a 520 hectare tea plantation, spread out as far as the eye can see. This region is also home to the renowned Antaimoro craft paper, beautifully decorated with dried flowers and leaves. Then head to Ambalavao, south of Fianarantsoa, one of the nicest of highland cities. Its cosy, brightly painted buildings with their steeply tiled roofs and carved wooden balconies make it an inviting, photogenic sight. Then, leave the national road and join the track to the Andringitra Massif. 2 night stay by the amazing cliffs, Camp Catta DBB. An all-day guided excursion within the Andringitra Massif: small, medium and grand tours are available, depending on physical conditions at the time. The Tsaranoro forest provides an opportunity to find 15 species recorded as endemic, including lemurs, 100 species of birds, 79 species of amphibians and 50 species of reptiles, alongside a great diversity of plants. Visit the natural pool, the top of Lagera Hill (noted for its wonderful view), and the surrounding villages. Then end the day back at our accommodation. Overnight stay, Camp Catta DBB. Back to national road 07, passing by the Bara country. 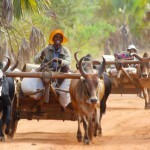 The Bara are a cluster of 18 pastoral Zebu farmer ethnic groups, mostly of African descent, living in the southern part of the central plateau. Late in the afternoon, arrive in Ranohira, the small town base, for a trip to the famous Isalo National Park, offering ravishing, dramatic landscapes. Overnight stay, Satrana Lodge DBB. Today, further explore the Isalo national park, the 81540ha home to some of Madagascar’s most stunning scenery, and a sacred place for the Bara, whose burial sites are marked by mounds of tiny stones placed in crevices in the rock face. Head up to the Massif where visitors enter a barren wonderland of twisted rock formations, extraordinary plants and wildlife that concentrate in the numerous shady gorges and cool, running streams that carve through the Massif. Then, visit the Nymphes waterfall before returning to the village and on to the lodge. Overnight stay, Satrana Lodge DBB. This morning we drive to Tuléar, passing by the Ilakaka village. This region has experienced a sapphire rush over the past few years and many Malagasy have come to seek their fortune in this authentic frontier town. 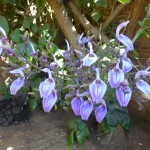 On entering Tulear, visit an Arboretum of almost 900 species of plants, 90% endemic to the region. City tour of Tulear, a town created in 1895 by a French architect who organised the planting of many trees, which now offer welcome shady protection from the hot sun. 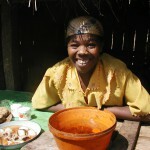 Transfer to Ifaty a small fishing village on the shores of the Mozambique channel. Overnight stay, Dunes d’ifaty Hotel DBB. After breakfast we take a boat ride on the lagoon which will take us to the village of Amboaboaky where we will stop for lunch and be served grilled crayfish under the mangroves. We return to Ifaty mid afternoon. 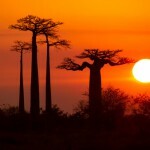 We head to the Reniala Baobab forest for sunset a great opportunity for photos. Overnight stay, Dunes d’ifaty Hotel DBB. Transfer to the airport and fly back to Tanà. Then transfer to the hotel. Free afternoon to visit the capital. Overnight stay, Belvédère DBB. We make our way to Andasibe 3 hours drive north east of the capital. We will stop at Peyreras private reserve where we will see a variety of butterflies, reptiles, frogs and insects endemic to this region. Once in Andasibe National Park we make our way to our accommodation. 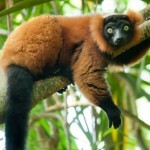 Here we will enjoy a walk at nightfall, were we can spot various nocturnal species of lemurs and tenrecs. Overnight stay, Vakona Forest Lodge DBB. We spend the morning observing the fauna and flora of Andasibe National park, where we hope to spot the Indri Indri, the largest of all the lemurs. After lunch we visit the private reserve of Vakona including the little lemurs island (a short canoe trip) back to the lodge late afternoon. Overnight stay, Vakona forest lodge DBB. Today is a day for leisure around the resort, a true gem offering a peaceful, serene setting that perfectly fits the genuine local touch of the island. It overlooks the translucent blue & turquoise lagoon of the Tamarin Bay and the legendary rock of Le Mome Peninsula. Overnight stay, Sands Resort & Spa Deluxe Rooms DBB. After breakfast, tour the wild south, including Trou au Cerfs, the crater of an extinct volcano, with its revealing, panoramic views of western Mauritius. Travel through the protected Macchabee forest with its interesting specimens of endemic timbers. Then, visit the Grand Basin lake, a holy place for the local Hindu community. After lunch, stop at the charming La Rhumerie de Chamarel, set in a rum distillery, for a guided tour. Then finish the day with a visit to the seven-coloured earths of Chamarel, an exceptional natural curiosity of volcanic origin. Return to the hotel in the late afternoon. Overnight stay, Sands Resort & Spa Deluxe Rooms DBB. After breakfast, transfer to the Pamplemousses Botanic Gardens, regarded as one of the most beautiful in the world. This 25 acre garden consists of 500 different plants species and spectacular flowers. Then, head to the Capital of Port Louis, with its fascinating cultural diversity, and visit its renowned, exotic and colourful market before heading to the village of Moka for lunch. In the afternoon, enjoy time for souvenir shopping and a visit to the colonial house of Eureka, situated at the foot of the Le Pouce mountain. A farewell dinner tonight in the capital before going to the Airport for flight 440, departing at 22.10 and arriving at 09.45 the next day . Arrive at Perth Airport as the trip ends.